This is not a difficult card to make but it is a little time consuming. The Christmas Release Technique Junkie stamp I used is called All is Calm - http://techniquejunkies.com/all-is-calm/. I used an embossing folder with black card stock. Then I painted the pine needles and the pine cone with Smooch paints. I used several shades of green Smooch paints. 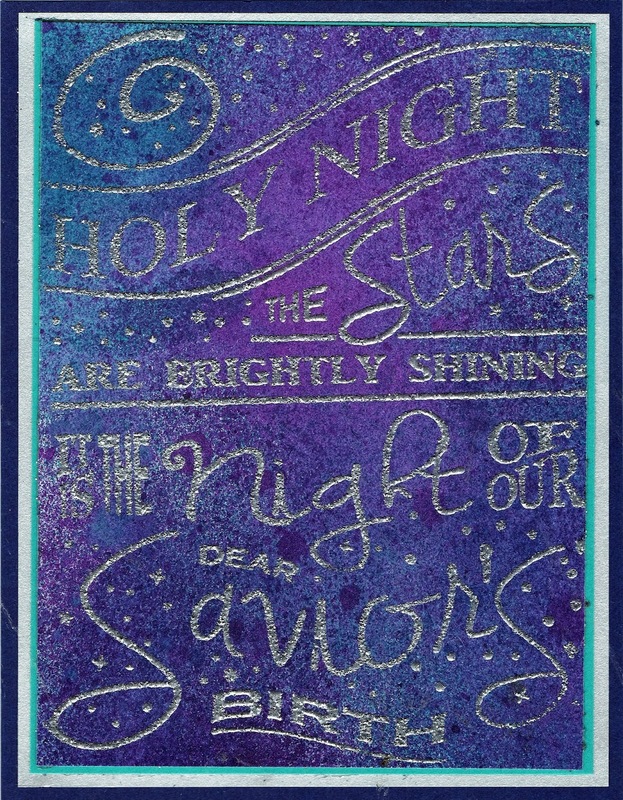 I stamped the saying on green paper with Versamark ink and covered it with detail gold embossing powder - then heat set. In real life the gold embossing powder really stands out! 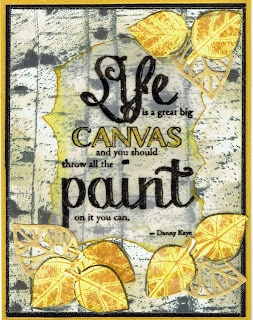 I punched out the saying and made two punches of the gold card stock. I cut those in half both vertically and horizontally so that I could layer the gold pieces behind the green card stock. A cool trick, right? This is just such a lovely card it doesn't need any other embellishments! Don't forget that all of the Technique Junkie Christmas release stamps are on sale for 15% off through October 10! Happy stamping and get inky! 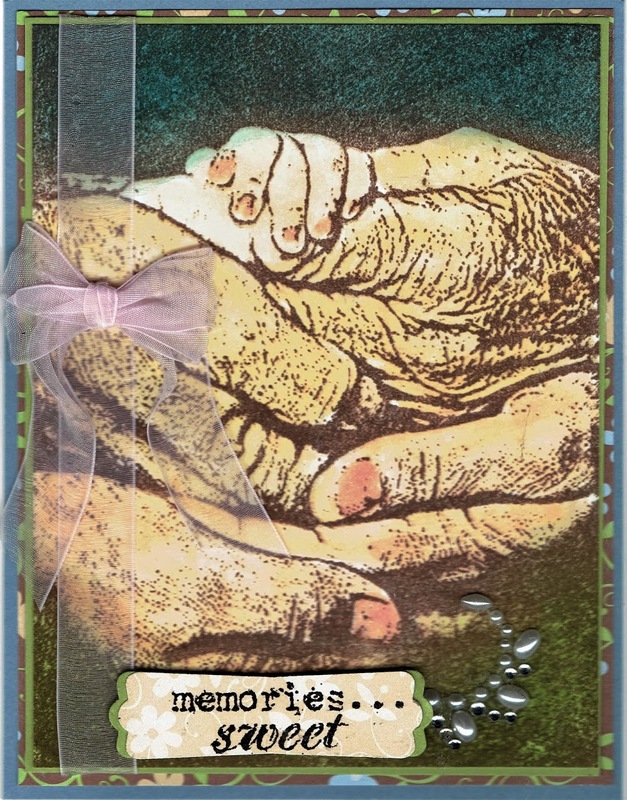 This beautiful card was so easy to create! It may be my Christmas card this year! Although simple and easy to do, it did involve several steps. 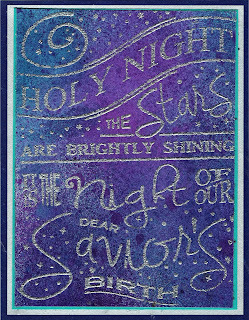 I used this lovely new Technique Junkie Christmas release called Stars are Brightly Shining - ________________ and white card stock. I first sprayed several colors of blues and purples of the Art Anthology Colorations Sprays. Then I used a sponge and burnished some additional dye based ink in the fuchsia color range. I heat set the card stock and then rubbed an Embossing Buddy over the surface so I could be sure embossing powder only went on the places I wanted it to go. I stamped the stamp image with Versamark ink, and then covered it all over with silver embossing powder, dumped off the excess, and heat set the embossing powder until it was shiny! I layered the focal image sheet on teal card stock, then silver, and then navy blue. Tada! Done! 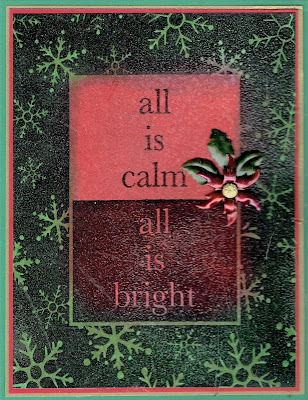 To create this card with this new Technique Junkie Christmas release stamp Calm and Bright - http://techniquejunkies.com/calm-and-bright/, I used Distress Inks and a sponge tool. I sponged red in the center of the card -- just guessing at about how much area to cover with red ink. I used two shades of red Distress Inks. Then I used two shades of green ink on the rest of the white card stock. I heat set the ink. I don;t always do this but since I wanted to use embossing powder, I knew I needed to do this or the embossing powder would stick to all of the Distress Ink because it stays wetter longer than most dye based inks. Then I inked up the stamp dye with black Versafine and carefully stamped on green and red areas. Then I covered it with clear embossing powder and heat set. I used Copic markers to color in the poinsettia flower and leaves. I pressed the end of the brad in my Versamark pad and dipped in yellow embossing powder and heat set. I did that twice. 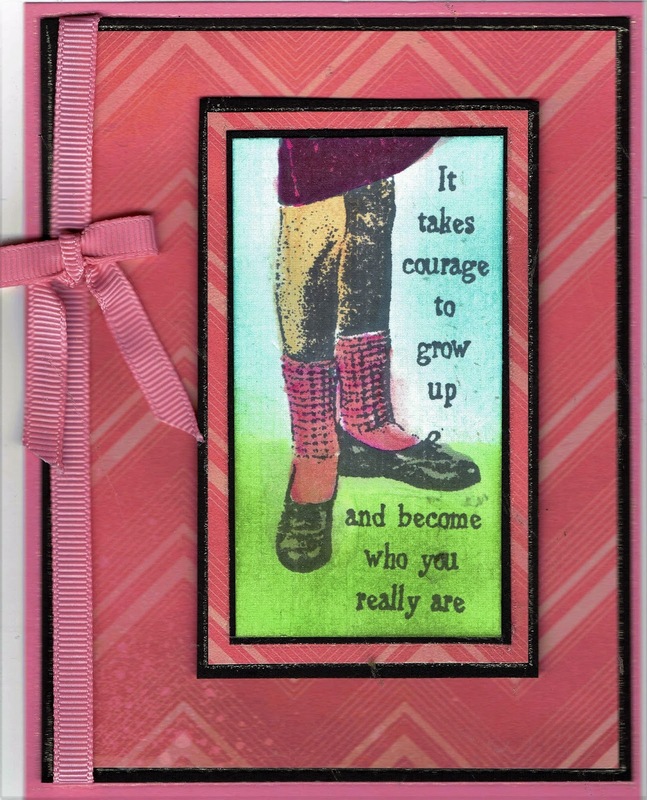 Adding that embellishment and lots of layers finishes the card. Have you started on your Christmas cards yet? I haven't except for these and I must start soon! And don't forget -- all of the Technique Junkie Christmas release stamps are on sale for 15% off through October 10. This is an easy Christmas card to make. I used white card and sprayed several colors of Art Anthology Colorations sprays. I stamped Technique Junkie Retro Sparkles - http://techniquejunkies.com/retro-sparkles/ - on top of the Colorations layer. 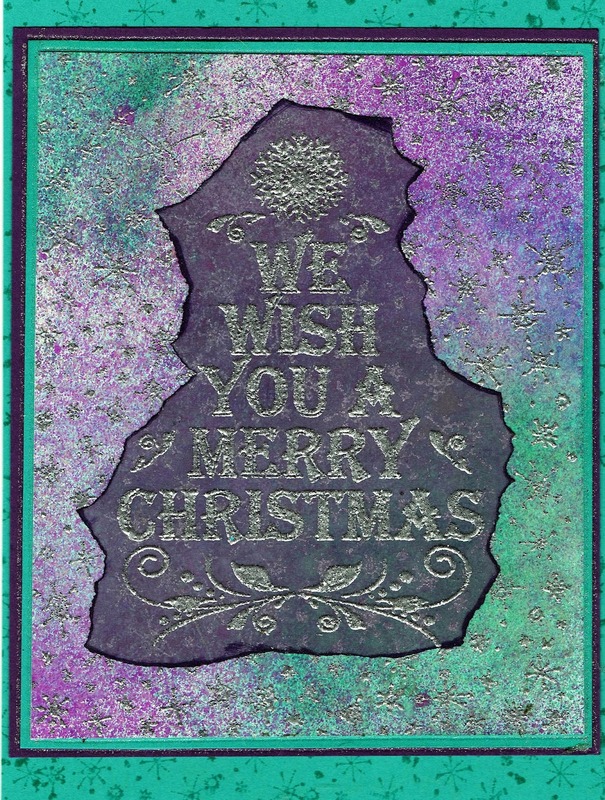 I used silver embossing powder over the Versamark ink and heat set. 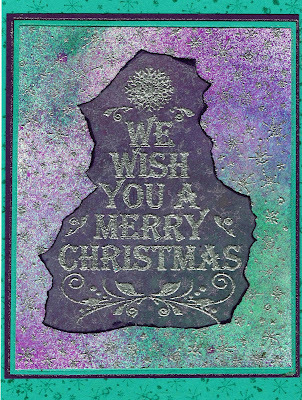 Then I stamped the newly released Technique Junkie stamp called Merry Christmas Wishes - http://techniquejunkies.com/merry-christmas-wishes/ - with Versamark on purple vellum. I covered the stamped image with silver embossing powder and heat set. I tore the vellum for visual interest and adhered it with adhesive from my Xyron machine to the top layer of the base card. After trimming the layers I need to use a teal card stock for the base card. I stamped the tiny little Technique Junkie stamp called Breathe - SDX027 - around the edge of the card stock for the base card. It is a special stamp that is not always available. You can write to Pat Huntoon and ask about it. And my card is done. Don't forget -- all of the new Christmas Release stamps are on sale now through October 10 -- for 15% off! Have a wonderful day -- happy stamping, and get inky! Today is day that we can show you some early release stamps for a Technique Junkie Christmas! I have two cards for you today. So sit back and enjoy! And then go to the Technique Junkie website to look at ALL of the new Christmas stamps. This Santa Giraffe is so fun and so cute! It is a new Technique Junkie Christmas release called Safari Santa - http://techniquejunkies.com/safari-santa/. I also used the Technique Junkie Joy stamp - http://techniquejunkies.com/joy/. I used Prismacolor pencils and gamsol to color in the giraffe. I used a white gel pen for the highlight in the eyes. I added some fake snow glitter flakes for the brim and the ball on the hat. 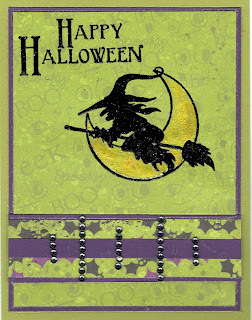 I used an embossing folder on the yellow layer and rubbed a brown dye based ink pad over the embossed areas. Lots of layers and a ribbon border and I was done. 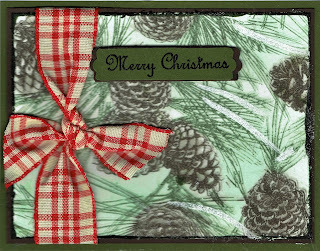 My second card features the new Technique Junkie release of Pinecones - http://techniquejunkies.com/pinecones/ and the tried and true wish of Merry Christmas (a Technique Junkie stamp) - http://techniquejunkies.com/merry-christmas-2/. I used markers to ink up the pine cones and the pine needles. Once that was dry, i sponged in some blue ink for the sky. Tjhen I used my Wink of Stella pen and highlighted the pine cones. 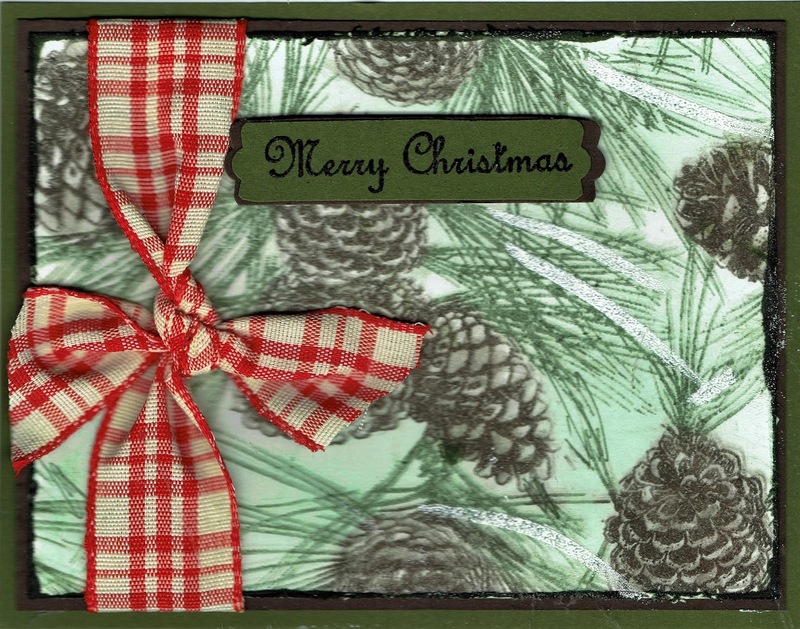 I used my Versamark [en and drew lines along a few of the pine boughs, covered with white embossing powder for snow. The focal image panel is layered first on dark brown card stock - then I tied the plaid ribbon, and layered it on a mossy green. The greeting is stamped with black Versafine ink, covered with detail black embossing powder and heat set. It is popped up with foam thingies. There is a very traditional feel to this card -- at least to me. And if the early release of Technique Christmas (and Thanksgiving) stamps isn't wonderful enough, Pat Huntoon has put all of these new release stamps on SALE for 15% off from now through October 10! So quick, go shopping! Get your new Christmas stamps before they run out! Please check back often for more posts about the new TJ stamps. My normal posting schedule is Monday, Wednesday and Saturday. I will be posting Christmas cards on those days for sure! Happy stamping -- and get inky! When we lived in New York State we had a lot of birch trees next to our home. Birch trees are very common in the northeastern section of our country. Native Americans living in the northeast used birch trees in many of their normal applications of natural resources. Fall colors in the northeast are spectacular. Once when my brother visited our family in October, we took him "leaf peeping." That is a common term used to describe going for a drive to look at the fall leaves. He was truly shocked at the beautiful colors and the variations of colors from tree to tree. He said to me, "I thought all those pictures of fall leaves being bright red and some purple colors added were painted on for effect." One of the things I learned after moving to the northeast after I was married for a few years is that different types of trees produce leaves with certain colors in the fall. Oak trees usually produce brown leaves in the fall -- but pin oaks can be red first and then turn to brown. Sugar maple trees produce bright red leaves. And birch trees produce yellow leaves. I wanted to have leaves that were relatively accurate for this card. I used three different Technique Junkie stamps to create this card: Birches - http://techniquejunkies.com/birches/, Life is A Canvas - http://techniquejunkies.com/life-is-a-canvas/, and Vintage Botanical Grapevine - http://techniquejunkies.com/vintage-botanical-grapevine/. The birch trees were stamped in a gray ink on white card stock. I used a gray marker to darken the spots on the birch trees. I added some gray ink and some pale tan ink just to add visual interest. When I don't have "exactly" what I "need" or want, I like to try and try and think outside the box and find something I can use. Then I inked up only the larger grape leaves on the grapevine stamp and stamped them on white card stock. I did this as often as I could get a leaf on the scrap of card stock. Then I used a small leaf die which was similar in shape to birch leaves to cut out the individual leaves. I used the brush tip of a brown marker to go around the edges of the yellow leaves to give them a distinct edge. I also had a die of the leaf skeleton and cut a few those out with gold text weight paper. The verse was stamped with Versafine black ink on white vellum, covered with black detail powder and heat embossed. The yellow was added with my yellow marker. I ran the vellum through a Xryon machine and adhered it to the card front. I added the various leaves in a design that appealed to me. I thought the verse really went with the fall theme of leaves bring a canvas of color in the fall. Fall can be very beautiful but it heralds in cold weather which I do not like. I enjoy warm weather much more than winter. I do hope you are enjoying the colors of fall -- get inky! 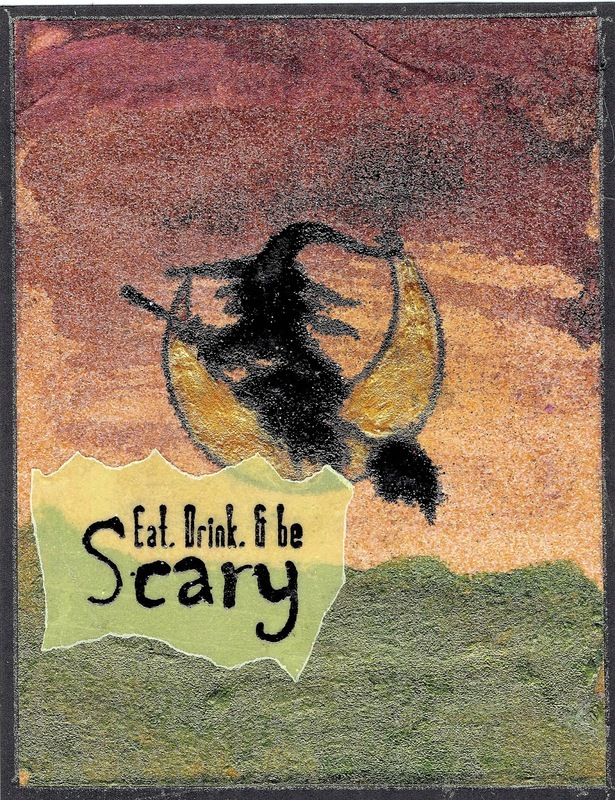 There are several fun Halloween stamps in the September release of Technique Junkie stamps, and this is only two of them. I used Ghost - http://techniquejunkies.com/ghost/ and Happy Halloween - http://techniquejunkies.com/happy-halloween/. 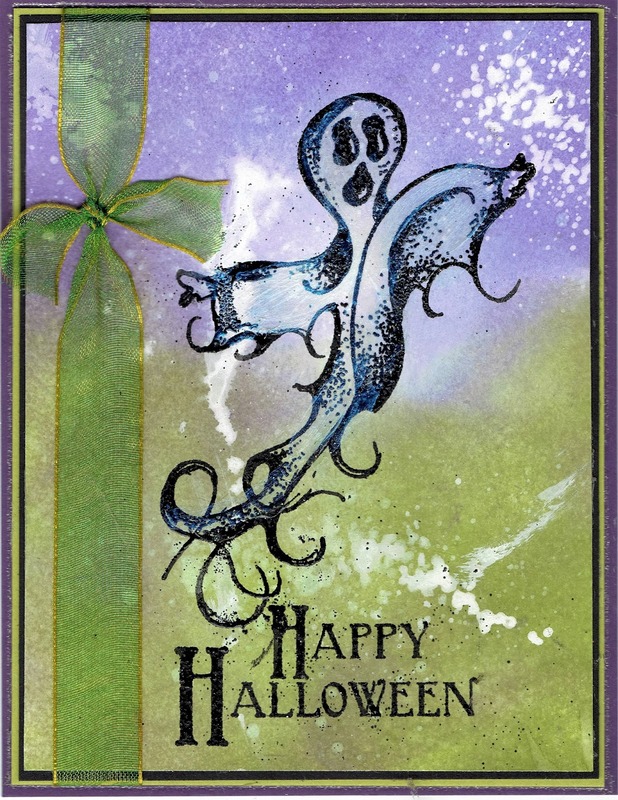 I used Distress inks and sponged on two shades of green and 2 shades of purple and blended them together in the middle. Then I spritzed some pearl glimmer spray over all. I also spritzed some white glimmer spray over the background. I stamped the ghost and the greeting in black Versafine ink, covered with detail black embossing powder, and heat embossed. I painted the ghost with some diluted white acrylic paint to still allow it have that ghostly appearance. I added some layers and a ribbon and it was complete! Children are wonderful creatures. God has given each child (person) unique abilities and a unique personality. Parents cannot help but desire the best for each of their children. However, it takes real patience (and self disciple) on the part of parents to allow their children to develop into who they"are" and according to their own interests. As a former teacher, I saw too many parents shift their interests and desires onto their children. Children are not an extension of their parents and who the parents wished they could have been themselves. 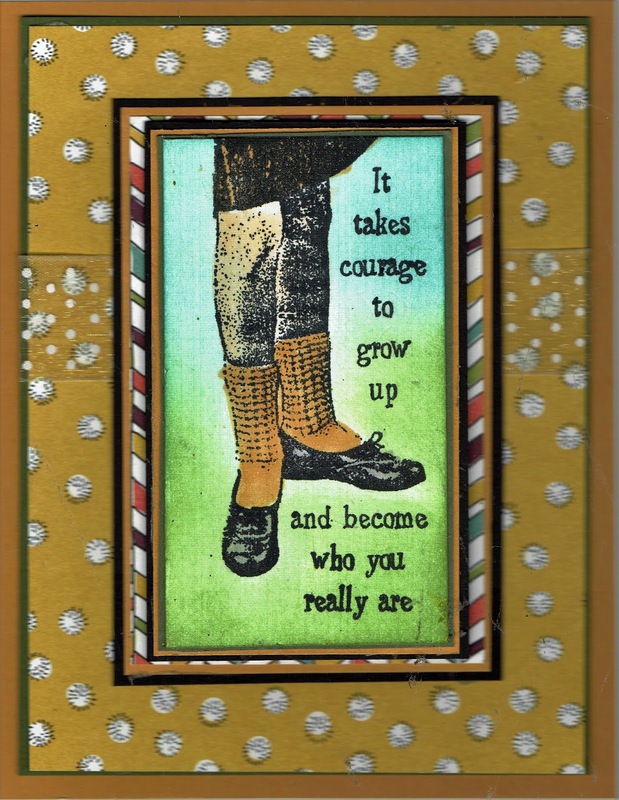 This stamp is one of the September newly released Technique Junkie stamps It Takes Courage - http://techniquejunkies.com/it-takes-courage/. I stamped the image with black Memento ink, and colored it with my Copic markers. I sponged on the grass and sky. Lots of layers finish the card. If you joined the Design Team on the September 1st blog hop, you saw that this newly released Technique Junkie stamp was among my favorite new stamps. There is an emotional reason behind that feeling as you know if you read my blog on that day. If you didn't -- well here is the direct link: http://judysstampart.blogspot.com/2016/09/lucky-you-september-is-here.html. The card I made with this stamp, Generations - http://techniquejunkies.com/generations/ - is the last card on the blog post. For today's card I also used a stamp from the Technique Junkie Stamps called Sentimental Sayings - http://techniquejunkies.com/sentimental-sayings/. To create this card, I used dye based ink pads. I used a medium brown pad for all the hands. I started inking the middle of the large stamp and worked out inking up ONLY the hands as closely as possible. Then I used a lavender ink pad and inked up above and below the hands. Because Pat Huntoon created this image with great detail on red rubber it was easy to see where the hands ended and the background began. Then I placed my white card stock directly on the stamp -- I did not turn the stamp over and place in the card stock. I firmly but gently pressed my hand and fingers on the back of the card stock and rubbed all over. I took care not to shift the white card stock as that would blur the stamped image. While the ink was still slightly damp, I took a damp (NOT WET) watercolor brush and pulled out the color from brown image. That was too much of one brown tone for me, so then I squirted a couple of drops of a peachy reinker on the back of an acrylic block, spritzed it with water to dilute the strength of reinker, and used that "paint" to add a peachy color to the skin tones of the three sets of hands. Then I used a very pale pink marker to add color to the fingernails. I chose my saying from Sentimental Sayings - http://techniquejunkies.com/sentimental-sayings/ and used black Versafine ink to stamp, covered the words with detail black embossing powder, and heat embossed. I decided to add a bit of lace at the bottom. I adhered it with red line tape. Because of the spaces in the lace The red line tape adhesive was visible. I didn't like that look so I sprinkled some purple embossing powder over the lace and the red line tape adhesive. Then I carefully heat set the powder taking care to not burn the lace. This would make a lovely Mother's Day card, Grandparent's Day card, thank you card for a baby gift, or a lovely birthday card. Birch trees do not grow every where but nearly every adult in America is able to recognize a birch tree by its very distinctive bark that peels off in layers. Birch trees only grow in northern climates. When I lived in New York State we had a lot of birch trees in the wooded area next to our home. Lest you think I stamped this Technique Junkie Birches stamp - http://techniquejunkies.com/birches/ in a crooked fashion -- this is how they grow. And birch trees tend to grow in groups of trees for some reason. You very rarely ever see only one birch tree in any given location. And although we think of them as being white and black, they also have tan colors in the bark. Bark of the birch can be white, grey, yellow, silver or black in color. Young trees have smooth bark. Deep ridges on the bark are characteristic for the older trees. Bark of most birch trees peels off in long horizontal strips. Care must be taken so as to not damage the tree when removing the bark. Many trees grow very wide trunks as they mature but birch trees do not. They always have very slender trunks. In spite of this, the bark was widely used by the Native Americans in the northern climates of North America. The wood is highly flammable when wet, and yet it is naturally waterproof. Thus the reason the Native Americans covered the exterior of their canoes and homes with birch bark. Then I stamped Technique Junkie stamps "Same Question" - http://techniquejunkies.com/same-question/ on tan vellum with back Versafine ink, covered with detailed black embossing powder, and heat set. I tore the vellum to add visual interest, and I ran a brown marker (brush tip) around the torn edges of the vellum to make it stand out a bit more. The vellum was adhered to the base card and layered via my Xyron machine. There are times in everyone's life when things do not go the way you plan. The tyranny of the "URGENT" becomes the driving force in a day's happening. That has been my last 3 days. I am scheduled to post to the Design Team blog on every other Monday. My "every other Monday" is Labor Day September 5. I will barely make it -- it will be almost midnight before this is posted. But it will be done! I was away for almost 2 weeks. I had to watch my three young grandchildren for almost 2 1/2 days straight. I will need to do this tomorrow afternoon as well. No crafting time with 7, 5, and 3 year old to watch! But here is my card for today - Monday, September 5. I used two NEW Technique Stamps to create my card. I used Be Scary - http://techniquejunkies.com/be-scary/, and Witchy Moon - http://techniquejunkies.com/witchy-moon/. Remember these stamps are on sale for 15% off through September 8! By the time I was able to begin to work on this card -- at nearly 9:00PM -- I was almost brain dead. But I forged ahead. I have found -- for me -- if I need inspiration I need to look at what ever scraps are laying around on my craft table and see what I come up with. And that is what I did! I saw a piece of orange glitter paper and wondered what I do with it. 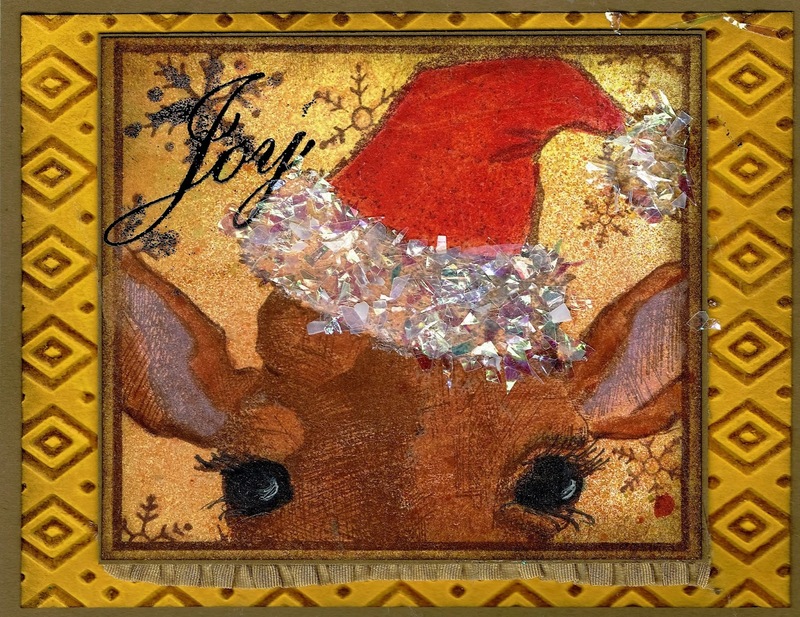 I used Art Anthology paints and some other thick paints very similar to those for this card. 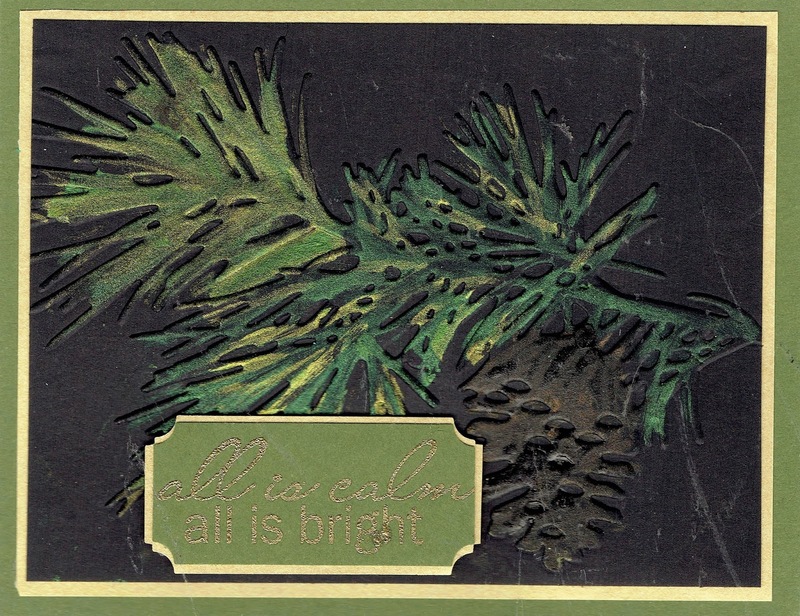 I spread of the green paints on the bottom of the trimmed to size orange glitter paper. Then I sprayed some purple Art Anthology Colorations spray across the top. I used a paint brush to spread that puddled Colorations spray across the sky. I heat set those paints. Then I inked up the witch with black Versafine ink pad and stamped it on the orange glitter paper. I wasn't even sure this would work because of the texture! I spread detail black embossing powder over the image and heat embossed. I was quite please with the results! A word to note - this glitter paper is very smooth! However, the center of the very solid parts of this image did not emboss as well as the edges. So I "painted" some the reinker for this ink pad over those solid ares and heat embossed with black detail embossing powder. Success! Now I want the moon to stand out against the orange sky. I first tried the Art Anthology gold Minx and painted it over the surface of the moon, It worked to a certain degree but not how I was now envisioning the moon to look. I put on two layers of the Minx and heat set between each one. Then I took some of the light yellow Art Anthology bger medium and painted over the moon. That was better but still not "quite right." So I got out the gold Minx again and spread more of that over the gel medium. That was closer to my imagination! Then I heat set it. As it dried the moon's surface developed sop,e interested texture. I stamped the verse on yellow vellum, heat embossed it, and ran it through the smaller Xyron machine. After tearing the edges I adhered to the card front. It is all layered on black card stock. Happy stamping, and get inky! Lucky You - September is Here! It is that wonderful time of the month -- the first of the month and it a Technique Junkie Blog Hop for the new September release of the latest Technique Junkie stamps! AND Pat Huntoon has the September Release of the Technique Junkie Stamps on sale for 15% off. Place your order, friends! You should have come from the blog post of Pam DeChellis: http://journeyawakensthesoul.blogspot.com/. The Technique Junkies Design Junkies blog starts off the hop - http://techniquejunkies.blogspot.com. If you didn't start with either of those blogs, please go back to the beginning -- with the Design Junkies blog! You do not want to miss out on any of the inspiration of the talented ladies on the Design Team. This month Halloween stamps stamps are among the featured stamps. So I thought I would start off my post with the Technique Junkies Halloween stamps I received. 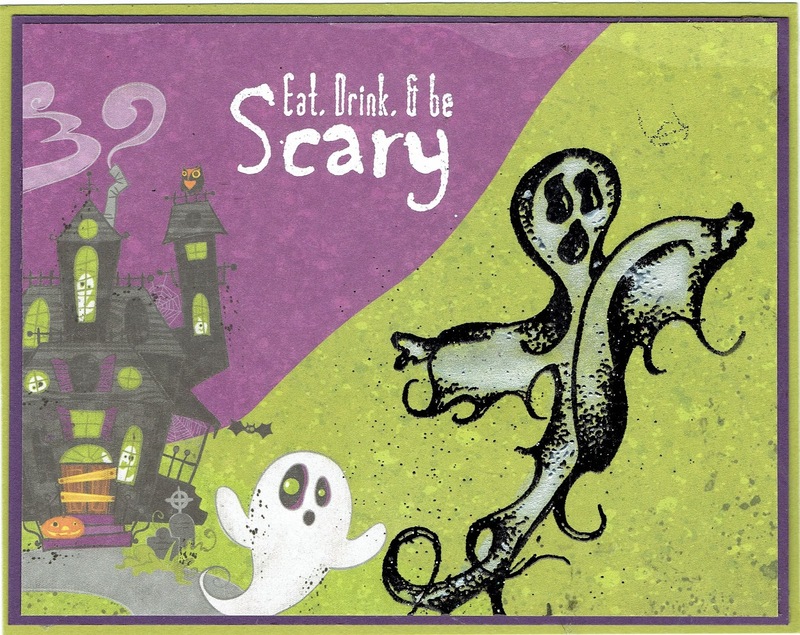 I used these Technique Junkie stamps: Be Scary - http://techniquejunkies.com//be-scary/ and Ghost - http://techniquejunkies.com/ghost/. 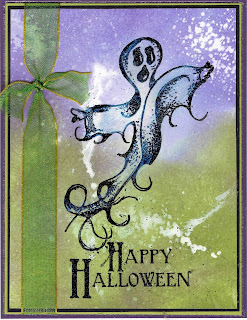 This was one of those happy things when I had just the right kind of background paper in my stash for this card and the next. Everything but the saying and the ghost are on the background paper. As soon as I saw the ghost stamp I thought of this paper. 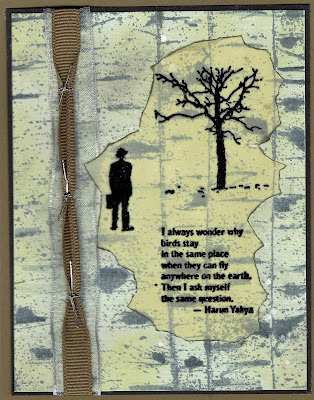 I used black detail embossing powder and heat embossed the image which was stamped with Versafine black ink. I used white Twinkling H2O's (2 shades) to color in the ghost. I like how the green paper sort of shows through the white H2O paint. The verse was stamped with white pigment ink and embossed with white embossing powder. Do you remember wearing bobby socks as a child and even into your teen years? I sure do -- although by my junior and senior year in high school that fad had gone out of style. I am aging myself here, aren't I? Often our bobby socks were white but we also wore colored socks to coordinate with our outfit. We never wore slacks to school - it was always a dress or a skirt. I used this newly released Technique Junkie stamp - It Takes Courage - http://techniquejunkies.com/it-takes-courage/ . I stamped the stamp (it comes with the verse!) with Black Memento ink and colored the image with my Copic markers. The sky is sponged on for the background. Ribbon and layers add the needed details to finish the card. http://techniquejunkies.com/generations/. Do you see the three different generations? I also used a portion of a verse from Sentimental Sayings - http://techniquejunkies.com/sentimental-sayings/. 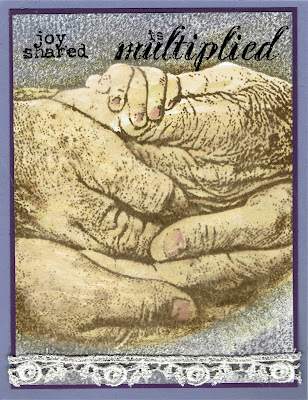 As a scrapbooker as well as making cards -- I have my child and her spouse's hands around feet and hands for pictures in a scrapbook. Every time i see those pictures, I remember the sweetness of that particular newborn child. But this particular stamp has a very special meaning for me and one of my daughters. Several years ago, my granddaughter was sitting in church between her Mommy and me. She reached over and arranged both Mommy's hands and my hands around her hands. I turned to my hubby and whispered take a picture as I KNEW that it would be precious and a "one of a kind" photo never to be taken again. This is that picture - do you see why I love this new stamp? Now for the rest of the line-up for this wonderful Blog Hop with very talented ladies. Be sure you hop all the way through -- and would you please leave a comment on the blogs? Let all of the ladies know which card you liked the best. We would all appreciate so very much. Did you know every Design Team member can be found Pinterest? Did you know there is a sale going on right now on the Technique Junkies website? 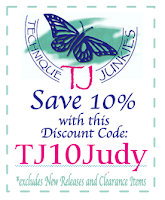 15% off all of the new September released Technique Junkie stamps! 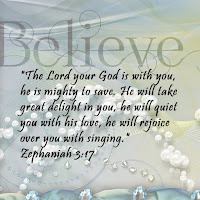 Judy Jackson: http://judysstampart.blogspot.com - you are here! Tonya Davidson: http://stampintonya.blogspot.com - go here next! Happy shopping, happy stamping -- and get inky!